Thanks for the link to N. Martin Gwynne's essay, an interesting read! As is made clear in almost all textbooks dealing with the history of mathematics and physics, the emergence of the theory of Relativity was intimately related to the Michelson Morley experiment and its dramatic failure to show any velocity for the earth’s travels through the ether. Explanations for that failure were strenuously sought. The obvious solution, that the earth was stationary, was, as has been seen in my essay Galileo versus the Geocentric Theory of the Universe, not even considered. The fact that the only applications of particle physics/nuclear physics I have heard of are these billion dollar projects that we can never verify, right away that sounds suspicious. My point was (firstly and on-topic) simply that we do not know anything about nuclear “revisionism” before the “conspiracy” era, or before the media so-called (“media” is in use from about the same time as “conspiracy theory”), i.e. about doubts and thoughts of men of more comprehensive visions. That Gwynne was one of them I am a nobody to verify. At the dawn of a “theory” i.e. at the beginning of its praxis, it is more probable that there still exist such a ones. Last edited by Mansur on Fri Aug 24, 2018 2:36 pm, edited 1 time in total. I liked Gwynne's courage of convictions. He strongly believed all particle physics was fake, thus he believed all applications of particle physics must also be faked. No matter how many facilities are working on the technology, no matter how many people are employed working on it, no matter how many brilliant scientists claim it is true, it still did not persuade him. This is the question itself. We have the title “Nuclear Bombs, the Nuclear Deterrent, and all other Nuclear Matters: The Most Fantastic Hoax of All?” but not the paper itself. It can be an “establishment work”, as patrix indicates, in that way or other. As his over-emphasized “catholicity” at the end of the Galileo paper is some indication in that direction. I read very fast so the Newton book and the Einstein book I read through. To be critical, Gwynne has places where he starts down a powerful chain of logic, using really deep insights. Like showing how in calculus we have to use common sense from outside of calculus to rule out answers. Eg.. x² = 4. And it gives the answer x = -2 and x =2. Yet we rule out the -2 because we know a length cannot be negative. So he says in the Einstein book that the Newton book goes into depth on the logical problems in calculus and how this leads to problems in the logic in other areas. Yet in the Newton book he doesn't even mention calculus. He spends like a paragraph or two enticing you with the beginnings of those actual logical arguments, then goes back to 10 pages of stupid quotes and his own speculations on the intentions of scientists and famous people from 100's of years ago. He takes the quotes of say a friend of Newton, on Newton, as the gospel truth(never considering that the historical record could be altered). For me I don't really care what Newton's underlying intentions were. Its like I don't judge a building by the political intentions of the architect. aa5 » August 26th, 2018, 12:16 am wrote: ...Its like I don't judge a building by the political intentions of the architect. On the other hand, Newton is pictured by mainstream history of science as representing the most disinterested hero of the scientific thought. But apart from his case: how should one treat the general tendency of “idealization”? How can it be scientific at all? Its possible the books we are reading have been edited with sections deleted. aa5 » August 27th, 2018, 8:11 pm wrote: Its possible the books we are reading have been edited with sections deleted. Perhaps even the text itself has been changed (omitting the paragraphs’ numeration of the original by which the cross references were made to the other parts of the book). Though the references are still there. We are in the nuke thread, and my point was (and is) that : what the hell this man could have said about the hoax in 1985? One difference between 1985 and 2018 is nuclear reactors looked more promising to the lay person in 1985. Granted, even in 1985 the governments were coming up with all sorts of excuses on why they couldn't keep building more nuclear plants to replace other types of electrical generation; especially coal for most countries. Then with their unfortunate disaster of Chernobyl in 1986, it gave the reason why no more nuclear plants would be built. In Hungary (where there is only one power plant) a campaign has just been going on for years (or it is over, at whatever result, I don’t know) to build a second one (with Russian “help”). Probably, these things are going on in many places as well, especially in the East and perhaps in Africa. So no shortage of entrepreneurial people in this field. Maybe only the fraud (and the fraudsters’ purposes) became extremely complicated. From time to time - and starting from today - I'm going to re-post some old posts of mine (as I am doing here). This, because of the very nature of this forum which, unlike a blog, causes articles to be "buried" over time (i.e. very difficult to find, even by myself!). Please understand that I am not lamenting this fact, as I highly value the contributions of each and every good member of this forum - but I just think it worthwhile to "bump" some of the more relevant posts that I've written in this last decade (and yes, I will also - from time to time / as the need arises - select and bump other particularly interesting posts by fellow Cluesforum members). At this point, I feel compelled to add some historical background to the nuke hoax. 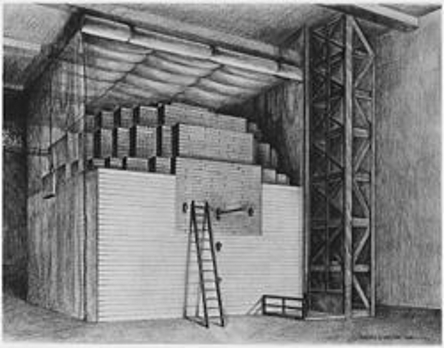 Since, as we have seen, NONE of the available film clips of "exploding atom bombs" look real - and were all probably crafted in the LOOKOUT MOUNTAIN STUDIOS (see last section of this article) - we need to understand how exactly all of this gigantic hoax played out, what with the many scientists we've heard about working within the "MANHATTAN PROJECT" and so forth. Here are the primary clowns who took credit for making the "atom bomb". Of course, the very idea of a bomb which obliterates an entire city (civilians and all) is the most insane and immoral thing you could ever imagine. Any person with a sound brain would instantly discard such a thing as a barbaric folly. Yet, the ten guys listed below have all been academically applauded and awarded for their - uh - extraordinary genius and scientific brilliance... in making Tha Bomb "come true"! So let's see what these 10 universally acclaimed individuals have in common. EINSTEIN, Niels BOHR, Enrico FERMI, Emilio SEGRE', Arthur Holly COMPTON, Eugene Paul WIGNER, Hans Albrecht BETHE. Well, ALL of them eventually turned into staunch campaigners against nuclear proliferation! Can you say "HYPOCRITES"? Now, do you know that Albert EINSTEIN (a staunch, self-confessed zionist - actually wrote in 1939 a letter to Roosevelt which, in substance, urged the US government to finance the development of the atom bomb - on the (bogus) grounds that Hitler might do it first? ENRICO FERMI (the "father of the atomic bomb") - and his "Chicago Pile"
But let's have a look now at world-famous (and Italian science icon) Enrico Fermi. To be sure, Fermi is credited with the very first nuclear chain reaction. Lets check out what few images we have of his Chicago Pile which he himself described as "a crude pile of black bricks and wooden timbers." Does the above contraption look like a nuclear reactor - or more like something like this? WHAT exactly is Mr. Fermi up to? Splitting atoms? Really? Or does this clip look more like some old Hollywood propaganda flick? In any case, we mere mortals do not understand what he is up to - and all we have are cryptic accounts about the "Chicago Pile" experiment. "On 2 December 1942, CP-1 was ready for a demonstration. Before a group of dignitaries, George Weil worked the final control rod while Fermi carefully monitored the neutron activity. The pile "went critical" (reached a self-sustaining reaction) at 15:25. Fermi shut it down 28 minutes later. Unlike most reactors that have been built since, CP-1 had no radiation shielding and no cooling system of any kind. Fermi had convinced Arthur Compton that his calculations were reliable enough to rule out a runaway chain reaction or an explosion. But, as the official historians of the Atomic Energy Commission later noted, the "gamble" remained in conducting "a possibly catastrophic experiment in one of the most densely populated areas of the nation!" Good Heavens! 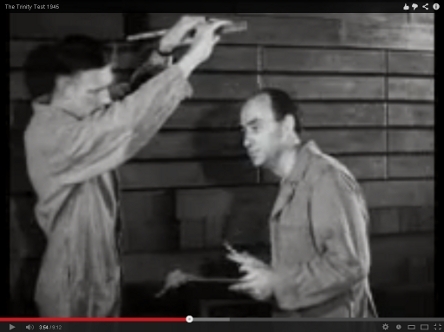 It seems Enrico Fermi was playing - rather foolishly - with fire! What a bold boy he was! He [Emilio Segrè] found in April 1944 that Thin Man, the proposed plutonium "gun-type" bomb, would not work (because of the presence of Pu-240 impurities), and priority was given to Fat Man, the plutonium "implosion" bomb. Wow - so around April 1944, the whole atom bomb theory - and its very feasibility - was still being questioned and up in the air! Back to the drawing board, guys! Hurry up! We need to get this thing to work by next year! Indeed, we are told that the first ever atom bomb test, the TRINITY test (July 16, 1945) was carried out successfully - only 21 DAYS BEFORE HIROSHIMA (August 6, 1945)! That's right, folks: we are supposed to believe that the bomb technology which barbecued Hiroshima and Nagasaki was tested only three weeks before its ...uh...'practical' usage. Woah, those were the days of technological efficiency ! The many available film clips of exploding atom bombs were - most likely - all produced in this secret film studio which remained secret until the 1990's. What little has been revealed about it - is that it "processed the atom bomb footage". We are therefore asked to believe that they just "processed real footage captured by real cameramen" in that studio. More likely, this is where they MANUFACTURED all their phony "A-bomb-test" animations. "Located in the hills of Hollywood, California, this secret film studio produced as many films as those of the Hollywood majors, yet most of those films were of a highly classified nature and unseen by all but a few. The mission of Lookout Mountain, also known as the 1352d Motion Picture Squadron under the command of the Air Force, was "to provide in-service production of Classified motion picture and still photographs for the Department of Defense and the Atomic Energy Commission (now the Dept. of Energy) between 1947 and 1969 when the studio was deactivated." "What would become known as Lookout Mountain Laboratory was originally envisioned as an air defense center. Built in 1941 and nestled in two-and-a-half secluded acres off what is now Wonderland Park Avenue, the installation was hidden from view and surrounded by an electrified fence. By 1947, the facility featured a fully operational movie studio. In fact, it is claimed that it was perhaps the world’s only completely self-contained movie studio. With 100,000 square feet of floor space, the covert studio included sound stages, screening rooms, film processing labs, editing facilities, an animation department, and seventeen climate-controlled film vaults. It also had underground parking, a helicopter pad and a bomb shelter. Over its lifetime, the studio produced some 19,000 classified motion pictures – more than all the Hollywood studios combined (which I guess makes Laurel Canyon the real ‘motion picture capital of the world’). Officially, the facility was run by the U.S. Air Force and did nothing more nefarious than process AEC footage of atomic and nuclear bomb tests. The studio, however, was clearly equipped to do far more than just process film. There are indications that Lookout Mountain Laboratory had an advanced research and development department that was on the cutting edge of new film technologies. Such technological advances as 3-D effects were apparently first developed at the Laurel Canyon site. And Hollywood luminaries like John Ford, Jimmy Stewart, Howard Hawks, Ronald Reagan, Bing Crosby, Walt Disney and Marilyn Monroe were given clearance to work at the facility on undisclosed projects. There is no indication that any of them ever spoke of their work at the clandestine studio. The facility retained as many as 250 producers, directors, technicians, editors, animators, etc., both civilian and military, all with top security clearances – and all reporting to work in a secluded corner of Laurel Canyon. Accounts vary as to when the facility ceased operations. Some claim it was in 1969, while others say the installation remained in operation longer. In any event, by all accounts the secret bunker had been up and running for more than twenty years before Laurel Canyon’s rebellious teen years, and it remained operational for the most turbulent of those years. The existence of the facility remained unknown to the general public until the early 1990s, though it had long been rumored that the CIA operated a secret movie studio somewhere in or near Hollywood. Filmmaker Peter Kuran was the first to learn of its existence, through classified documents he obtained while researching his 1995 documentary, “Trinity and Beyond.” And yet even today, some 15 years after its public disclosure, one would have trouble finding even a single mention of this secret military/intelligence facility anywhere in the ‘conspiracy’ literature." THE ATOMIC FILMMAKERS: (a silly film about the supposed heroes who "risked their lives filming the A-bomb tests"). BERLYN BRIXNER: "the head photographer for the Trinity test, the first detonation of a nuclear weapon in July 1945." "The Federation of American Scientists estimates there are more than 17,000 nuclear warheads in the world as of 2012, with around 4,300 of them considered "operational", ready for use." The nuke bombs are most probably non-existent. A stinking blob of hot air. An effective fear-mongering bluff which, to this day, is being used to control the masses. The old hoax evidently still works - and very nicely indeed. This is hoping that our efforts at this forum may relieve you of the nightmarish and anguishing nuke feary-tales that we keep getting bombarded with on a daily basis - via the mainstream media. For more insights into the Nuke Hoax, please go to: NUKE LIES - a now frozen forum curated by "Rerevisionist" (whom we are fortunate to have as a Cluesforum member). Here's an interview with Rerevisionist on the excellent Abirato radio show. Today, I just bumped into this page on the website of "Goilombardia.it" - an Italian masonry website. The page proudly lists Enrico Fermi as an illustrious member of the masonry. Of course, Enrico Fermi was the purported "Director" of the supposed Chicago Pile experiments which allegedly proved the "atomic chain reaction" - which, we were told, led to the reported manufacturing of the two airborne atomic bombs ("Fat Man & "Little Boy") which - as the story goes - were dropped (soon after the discovery of the atomic chain reaction!) on Hiroshima and Nagasaki. In Italy, Enrico Fermi is considered pretty much as the "Italian Einstein" - and many streets all around Italy are named after him. An absolute must watch - of the Nuke Hoax propaganda / mass deception - which fooled the entire population of this planet. Enjoy ! 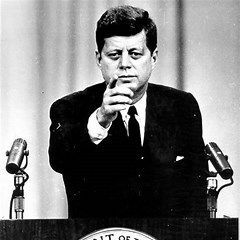 JFK was obviously in on the Nuke Hoax (as well as the "Man on the Moon" Hoax). To believe the contrary is - in my honest opinion - quite naive.